Eric Edberg is a classical and improvising cellist, organizer, teacher, coach, and consultant dedicated to using music and the creative process to bring people together in celebration of life and the power of the arts. The founding artistic director of the Greencastle Summer Music Festival, which “brings the community together with friends making music for friends” through weekly free concerts, Eric has played in nursing homes, schools, and hospitals, participated in “Bach in the Subways Day” in New York, and organized the 2012 “Bach Everywhere Day,” in which students and faculty of the DePauw University School of Music (where he is the cello professor) perfomed across the campus and city in celebration of the composer’s birthday. Students in Eric’s DePauw courses on the creative process, concert presentation, and audience building have organized and produced multi-genre, club-style concerts, an in-the-round fundraising concert, and a campus folk/rock festival. His idiom-combing improvisation students form one of the country’s first non-jazz performing improvising ensembles, and have been featured in the Wall Street Journal. A community drum circle facilitator, Eric leads workshops in which young people learn to lead drum circles as a way of developing leadership skills, self-confidence, and a sense of supportive community. He has presented his workshop “Expressing Yourself Through Sound: Improvisation for Everyone” at numerous universities. Eric has played concertos, recitals, and chamber music concerts throughout the country, in Europe, and China. 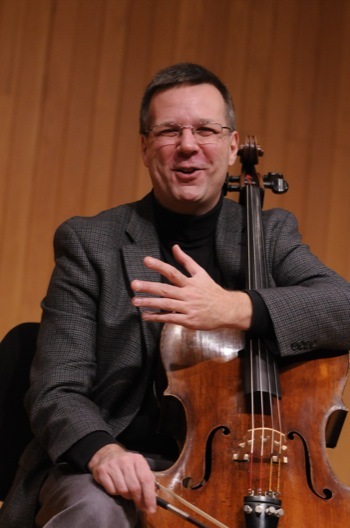 He has been the principal cellist of the Annapolis and Terre Haute symphony orchestras, and performs regularly with the DePauw Chamber Players. He attended the North Carolina School of the Arts, Juilliard, Peabody, SUNY Stony Brook, and Florida State. His teachers included Laura Sias, Nelson Cooke, Gary Hoffman, Marion Davies, Denis Brott, Channing Robbins, Leonard Rose, Bernard Greenhouse, and Roger Drinkall. He had extensive coaching from violinist Berl Senofsky, and spent the fall semester of 2010 observing Janos Starker. He is a graduate of the Music for People Music and Leadership Program (improvisation techniques and facilitation) and has been trained in drum circle facilitation by Arthur Hull.